In Part 1, "Business aspects and project engagement considerations" on page 1, we discuss the reasons why you should deploy a License Management solution. We also position License Management in the overall picture of the IT Service Management and describe the IBM solution in this area. We also provide best practices on how to approach and engage such a project. The high level tasks of such a project are also introduced. We emphasize the fact that you must not only realize what the key elements are that need to be managed to make your project a success, but also how you should organize your IT operations to get the highest benefit from your solution. 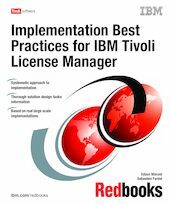 In Part 2, "Solution design considerations" on page 57, we provide detailed information for the architecture and design of a IBM Tivoli License Manager V2.2 solution implementation. Both IT Architects and IT Specialist benefit from the information provided in this part, as it covers a great deal, from an introduction to IBM Tivoli License Manager V2.2, its components, and architecture, and solution design fundamental tasks, to detailed physical and logical design and configuration of all components of an IBM Tivoli License Manager V2.2 solution.